Ex-Manchester City midfielder Yaya Toure’s agent Dimitry Seluk tweeted an image depicting his client using a voodoo doll to taunt Pep Guardiola on Thursday. City lost their first game of the 2018-19 Champions League group stage against Lyon on Wednesday night, with Nabil Fekir grabbing the winning goal in a 2-1 victory for the visitors. Maxwel Cornet opened the scoring for the French outfit before Fekir doubled the lead with a superb solo effort soon after as Guardiola’s Premier League champions seemingly struggled to cope with the intensity of their opponents in the first 45 minutes. The Citizens did improve in the second period and found a way back into the game when Bernardo Silva scored after 67 minutes, but Lyon ultimately held on for a famous victory at the Etihad. 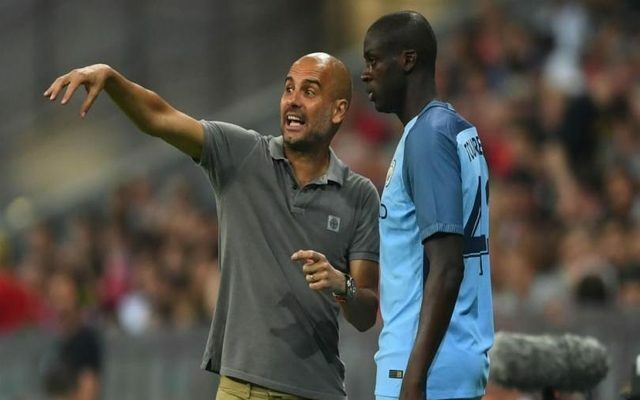 Toure, who left City during the summer to join Olympiacos, has found himself as the centrepiece of his agent’s latest swipe at Guardiola, having been depicted with a voodoo doll of the Spanish coach in a recent post on Seluk’s Twitter account. The Russian agent has publicly criticised Pep on a number of occasions – as per The Daily Mail -and this latest attempt to mock him will likely have been met with rolled eyes amongst the staff at the club already.